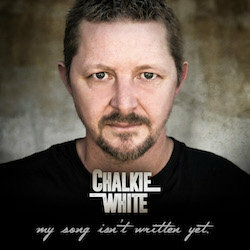 Chalkie White is driven by his love of music. From the age of 9 when he first picked up a guitar, White has been honing his craft. At the age of 16 it was time to join a band, and by 18 talent quests were a staple for Chalkie. Winning the Gympie Muster Talent Search in 2001 and cracking the Toyota Star Maker grand final at Tamworth in 2002 were early career highlights that helped prove his credentials on a bigger stage. The year 2016 brought a new bout of life challenges for White when he was diagnosed with cancer and made many important life decisions, one of which was to make his next great song count and release it for the world to enjoy. 2017 saw this rounded and travelled Country Music artist release his highest ever charting single. The track ‘New Day’ hit #4 on the iTunes Country Singles charts and cemented Chalkie yet again as a serious artist on the Australian music scene. Not looking back, in April 2018 came his debut full length album, My Song Isn’t Written Yet, landing at #1 on the ARIA Australian Country Album Chart. Gingerbread Man is about not staying in one place and not really seeking stability...embracing wherever your passion takes you.